What happened in the markets in January? We’ve seen an upbeat start to the year for global markets which warmed to the US Federal Reserve’s sentiments of a more accommodative monetary stance. Furthermore, the US earnings reporting season, which began in the second half of January, gave global equities a boost with some positive surprises, which saw US equities experiencing the best January in about three decades. And the JSE tracked the global markets upwards. The S&P 500 climbed 7.9%, while the JSE all share index and the top 40 index – which most local funds are modelled on – rose 2.7% and 2.6% respectively. An equally-weighted JSE portfolio of non-commodity ETFs gained 1.11% in January. Funds that track local assets rose 3.11% on average. Contrarily, due to a 7.7% gain in the rand against the dollar, funds that track global markets ended 2.01%. However, if we exclude the two Cloud Atlas funds which both track African equities and severely skewed returns negatively, international asset funds would have lost 1.1%. 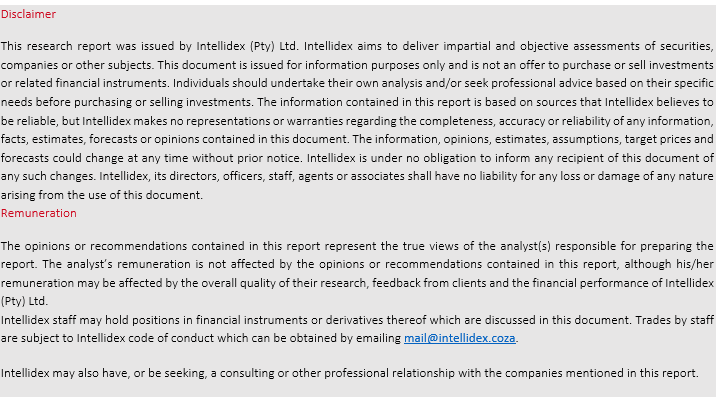 Intellidex’s selection of ETFs, on an equally weighted basis, edged up by 0.89%. Some positivity returned to the property sector in January after one of its worst years in recent memory last year. The best performers were four Reit ETFs which returned between 7.7% and 10.2% during January. 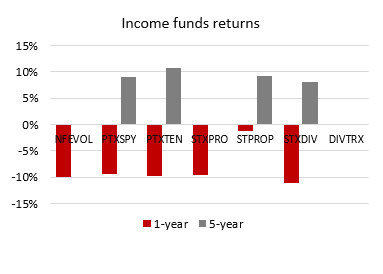 Conversely, industrial-themed funds were the worst performers, with the NewFunds S&P GIVI SA Industrial ETF shedding 0.14%. Various empirical studies show that the bulk of equity returns stem from diversification among broad asset classes rather than from individual stock picking. As such, our grouping is done with a diversified portfolio in mind, ensuring appropriate exposure to different asset classes. First, we group the ETFs according to the three widely recognised asset classes – equities, bonds and cash. We further split equities into geographic groupings. We then add a category for equity ETFs with an income theme. Our picks should provide an investor with a relatively diversified portfolio, even if it is made up only of ETFs. However, asset allocation is not a one-size-fits-all concept. You need to make sure that weights of different asset classes in your portfolio meet your unique risk and return objectives. 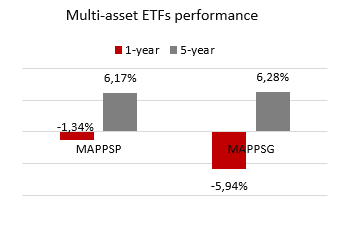 Multi-asset ETFs, which are already diversified among asset classes, are analysed as a separate category. As a rule of thumb, we like ETFs that follow a simple but watertight investment philosophy. 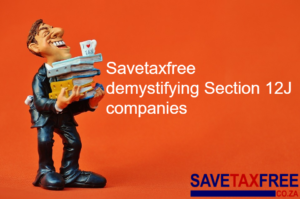 They should also be tax smart, which means they should qualify to be in a tax-free savings account. To avoid over-concentration, a good ETF should cap its exposure to a single sector and/or a single counter. While ETF costs are still coming down as competition among local providers intensifies, we look at this metric closely and prefer ETFs with low total expense ratios (TERs). In a depressed economic environment with rising interest rates, the need to invest in quality companies with good debt and return metrics cannot be overemphasised. Against this backdrop, we maintain our January pick, the Satrix SA Quality ETF. The fund grew 1.95% in January. SA equities are showing value attributes relative to their historical average and to other emerging markets, but the drivers of our economy are moribund. President Cyril Ramaphosa’s state-of-the-nation address (Sona) didn’t do much to change Intellidex’s 2019 forecast that the economy will grow by 1.5%. Arguably, the most important Sona announcement related to splitting Eskom into three parts (generation, transmission and distribution), but it lacked specifics and gave the impression of kicking the can down a very long road. The rest of the Sona was heavy on economic-related commitments, but we think implementation remains highly problematic. Government’s ability to implement economic policy also remains in serious doubt. As such, there are no reasons to upgrade long-term growth expectations. Although inflation eased in January due to lower fuel prices, trading updates from most listed retailers disappointed, which partially explains the poor showing of broad industrial sector funds. Risks to the inflation outlook remain moderately to the upside due to concerns around administered price increases and food price pressures, but we believe inflation will remain subdued during the year. We like the Satrix MSCI World Equity Feeder ETF which lost 0.81% in rand terms in January, although its dollar return was positive. It is diversified across the globe – US, Europe, Japan, Canada and Australia –with more than half of the funds invested in US stocks. Since it is a market cap-weighted fund, its holdings reflect the dominance of US equities on the global platform. A good alternative in this category is the Ashburton Global 1200 Equity ETF, but the Satrix MSCI World has a lower expense ratio. improving, including new sales orders and business conditions in six months’ time. Not all is doom and gloom. Some encouragement comes from an important forward-looking metric: the FNB/BER consumer confidence index held steady at +7 in Q4 – above its historical average reading of +2. This suggests that consumers’ willingness to spend is still relatively high. Although global dollar-denominated funds fared well in January, the concurrent strengthening of the rand ensured that benefits did not fully filter through to JSE funds that track international assets. However, the Sygnia/Itrix 4th Industrial Revolution fund was the star performer in the international asset category, returning 3.41% in January, followed closely by property funds. However, the Cloud Atlas funds – with African ex-SA exposure – tanked spectacularly, dipping by double-digit percentage points. Global bonds also fared poorly. The drivers of international asset performance are mixed. While the US largely remains resilient, the eurozone and China are showing weakness. We believe global equities will be highly sensitive to monetary policies and US-Sino trade relations. In the US, the IHS Markit composite flash PMI for January ticked up slightly to 54.5 points from 54.4 in December. This shows that US growth remained reasonably solid at the start of 2019 despite the prolonged US government shutdown. The choice in this segment is limited to two funds: Satrix MSCI Emerging Markets and the Cloud Atlas AMI Big50. We prefer the Satrix MSCI Emerging Markets ETF (down 0.16%) because of its extended diversification outside Africa. Unlike the Cloud Atlas fund (-15.25%) which invests in African stocks only, the Satrix fund invests in a wider range of emerging economies, including some of the fastest-growing markets such as China and India. In addition, the fund is the cheapest within its category, boasting a TER of 0.4%. This year we expect an interest rate hike and a sovereign credit downgrade (by Moody’s, to sub-investment grade) which is likely to dent the performance of South African bonds, but potentially increase the yield on cash investments. However, bonds remain an integral part of a broadly diversified portfolio. If you are investing for a very short period, usually less than a year, then the NewFunds TRACI 3 Month (up 0.57% in January) is a natural choice because it is least sensitive to sudden adverse interest rate movements. It is like earning interest on your cash at the bank with a minimal possibility of capital loss. the weakness is broad based, with output in the services and manufacturing sectors both reaching multi-year lows. Furthermore, the index measuring new work fell sharply from December, signalling the largest drop in demand for goods and services since June 2013. As such the European Central Bank kept interest rates unchanged in January with bank president Mario Draghi lamenting the increase in downside risk to the eurozone growth outlook. In a similar move, the Bank of Japan kept its key short-term interest rate unchanged at -0.1% and kept its target for the 10-year government bond yield at 0%. In Asia, the Chinese Caixin/Markit manufacturing PMI fell to its lowest level in almost three years to 48.3 in January from 49.7 in December. The Chinese economy has started the year on the back foot amid both trade and domestic private debt challenges. If you find the process of diversifying your portfolio daunting, two ETFs can do it for you. They combine equities and bonds to produce a diversified portfolio for two investor archetypes. They are the NewFunds Mapps Protect ETF (up 2.25%) and the NewFunds Mapps Growth ETF (up 2.74%). They are designed to meet two different risk appetites: Mapps Protect is more conservative, usually suitable for older savers. Mapps Growth suits investors with a long-term horizon. For a longer investment horizon, protecting your investment against inflation is paramount. A local inflation-linked bond choice is ideal because it is directly related to our local currency and purchasing power conditions. We therefore maintain our choice of the Satrix ILBI ETF (up 1.65%), which has the lowest expense ratio in this category. 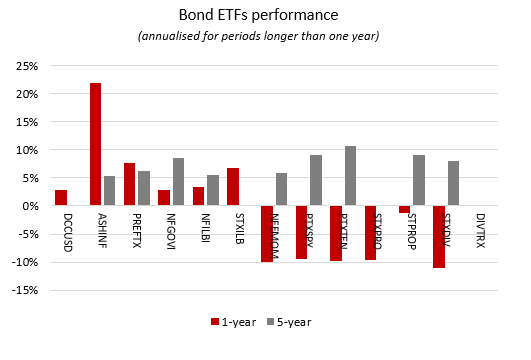 Furthermore, nominal bonds add a unique risk-return dimension that differs from inflation-linked bonds and improves overall portfolio performance. As with equities, investors also need to diversify their bond portfolios internationally. We think investors can choose between Stanlib Global Bond ETF(down 7.03%)or Ashburton World Government Bond ETF (down 6.09%). They track investment-grade sovereign bonds mostly issued by the US, UK, Japan and selected European countries. However, the Stanlib Global Bond ETF has the lowest TER. If you rely on your investment income for day-to-day expenses, you may want to allocate a portion of your portfolio to ETFs that have a high distribution ratio. Compared with dividend funds, property funds tend to have higher payout ratios. We maintain our choice of the Stanlib SA Property ETF (up 9.11%). The Stanlib fund boasts the lowest TER in the segment. However, investors can also consider foreign property ETFs. The Sygnia Itrix Global Property ETF (up 1.44%) is the cheapest in this category.